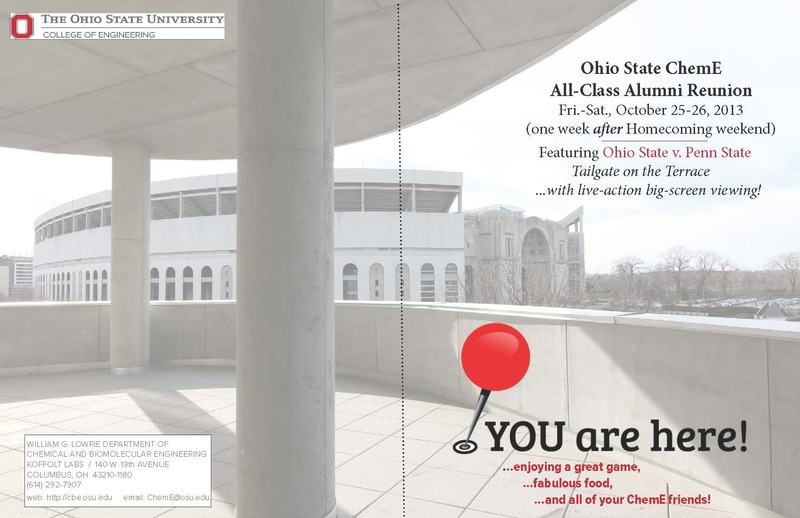 The All-Class CBE Alumni Reunion was held the weekend of the Ohio State v. Penn State game, Friday and Saturday, October 25-26, 2013. It was a fun-filled weekend reconnecting with friends! You can check out the event recap here: http://go.osu.edu/CBE2013ReunionRecap. Starting Friday (October 25), over 80 people toured new Koffolt Labs. Around 60 followed up wtih dinner, getting caught up with former classmates and faculty. Then on Saturday, 100 people gathered for lunch, group photos, and a Department Update from Chairman Cooper. Some folks even took a tour of old Koffolt Labs/Unit Ops. As a special bonus on Saturday, the CBE-Only Tailgate on the Terrace (Knowlton School of Architecture, second floor terrace) brought in 105 attendees. Tailgaters especially enjoyed the hot chocolate and coffee bar that day, as it was more than a little nippy! Finally, some people without tickets to the game stayed to watch it on the big screen in Knowlton's auditorium. Participants left with that great "Buckeye" feeling. THANK YOU to everyone who participated in the reunion, and an even bigger thank you to those of you who graciously contributed to the new building! It is greatly appreciated. 6:30 pm - Dinner ($25 per person, or $35 per person with two drinks included). NOTE: DINNER HAS BEEN MOVED TO THE BLACKWELL (third floor lobby area of Pfahl Hall). Signs will be posted. 8:00 pm -- Game-watching in 250 Knowlton Hall Auditorium for those who don't have tickets in the 'shoe.